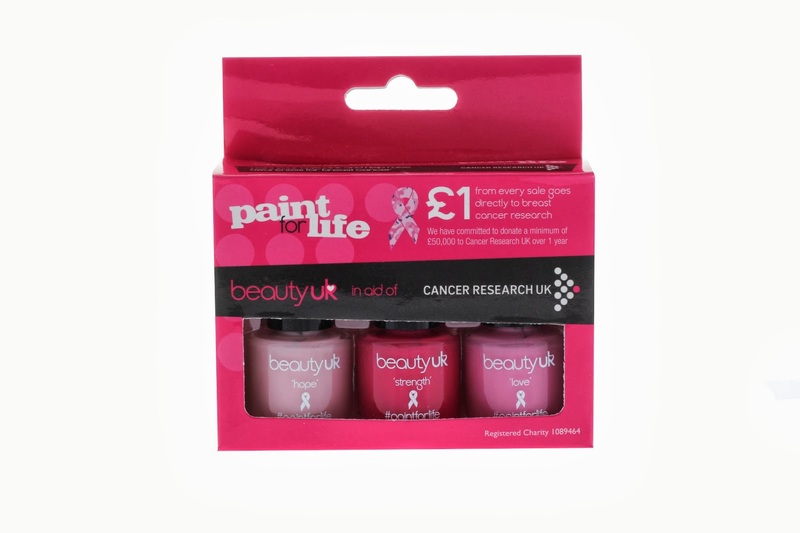 The Paint for Life box set from affordable brand, Beauty UK, contains three cream finish nail polishes in different hues of pink, each with inspirational names such as "Hope", "Strength" and "Love". The set was created in honour of a Beauty UK fan who had first-hand experience of fighting breast cancer. The names of the polishes were chosen to help raise awareness and act as a reminder of the cause. "Hope" is a soft, chic pale pink, "Strength" is a fun, bold fuchsia and "Love" is an unashamedly girlie Barbie pink. I have to confess that Beauty UK isn't a brand with which I'm overly familiar but I was impressed with this set. For the purposes of the photo above, I opted to paint my nails with the Barbie pink shade, called "Love". The polish had a smooth, relatively thin formula and needed three coats for full opacity but once on the nails, I was impressed with the longevity. 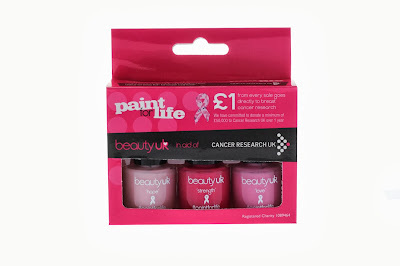 I'd definitely recommend checking out the Beauty UK Paint for Life box set. The trio costs just £5.99 and £1 from each sale will be donated directly to breast cancer research work carried out by Cancer Research UK. What's more, I was impressed to note that the donation equates to a generous percentage of the sales price.